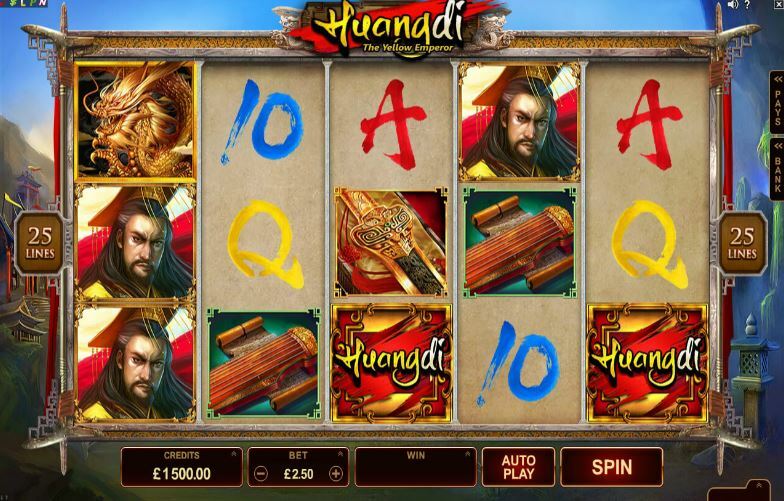 Huangdi -The Yellow Emperor Online Slot is a 5 x 3 reel, 25-line game featuring ancient Chinese Symbols, Wilds and Scatters marching across the reels and is powered by Microgaming. Set within the backdrop of the historic battle of Zhuolu, lead yourself to historic wins on this Chinese themed slot, and you’ll really feel like an emperor! Huangdi – The Yellow Emperor offers the Expanding Symbols feature. Watch as the powerful and animated Huangdi Symbols expand in the base game and Free Spins to award extraordinary pay-outs. When 3 or more Golden Dragon Scatters land anywhere on the reels, you will be awarded 15 Free Spins, which can be retriggered during the feature. Huangdi also offers Stacked High symbols on reel 1 in both the base game and Free Spins, while the commanding Huangdi symbol is stacked on all Reels. All other matching High symbols contributing to a win will expand to fill the reel to award even greater riches.